Serving Broken Arrow OK, Tulsa OK, Muskogee OK, and Claremore OK - Dr. Trischa Clarke and Dr. Lindsey Helmerich are your general family care dentists, offering complete dental health care for children, teens, and adults. 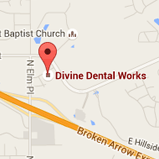 At Divine Dental Works, we believe in comfortable dentistry, confident smiles, and building lasting relationships with our patients. Our Broken Arrow OK dentist, Dr. Trischa Clarke and her team work together with you and your family to improve and maintain your smiles for generations. Our practice is comfortable; we offer a warm, stylish, and friendly environment, where your dental health is our top priority. Dr. Clarke provides several dental treatments, including general teeth cleaning, teeth whitening, cosmetic dentistry, pediatric dentistry, Invisalign, single appointment in-office Cerec crowns, sedation and operative dentistry. We are proud to welcome patients of all ages to our practice, and we invite you to sit back, relax, and get ready to enjoy the benefits of a beautiful, healthy smile. Please call our Broken Arrow OK Dental Office at (918) 615-3580 to schedule your next dental appointment with Dr. Clarke and Dr. Helmerich.